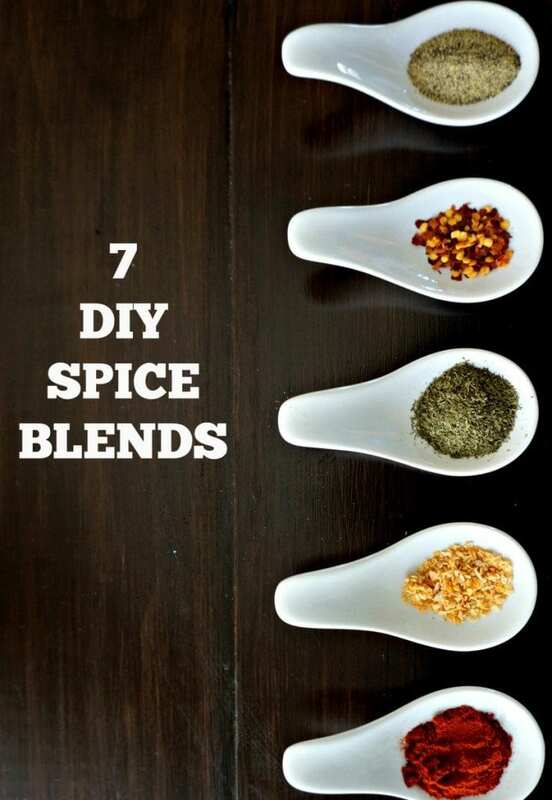 Homemade Spice Blends: 7 Make your own spice blends to use to save money and skip nasty additives. Look into just about any kitchen pantry and you most likely find prepackaged spice blends. I mean how else would you make tacos, without that little handy spice packet? Do you find yourself relying on those packets for not just tacos, but for vegetable dips, chili, and maybe even meatloaf? I am going to STOP you from buying those packets… Permanently!!! And the good news is that it will not just save you money, but it will also prevent you from ingesting many of the additives that are used in those little packages–like MSG, corn syrup solids, food coloring, etc. So take a look again in your pantry–I bet you have everything on hand to make every one of these spices!! This will be your new go to resource for all the spice blends you need–I can guarantee these homemade blends are full of flavor, only take seconds to make and are customizable for your family’s taste preferences. If you like your chili spicy, add in a bit more red pepper flakes–if your family hates cumin, omit it from the taco seasoning–you get the gist. For herbs de provence, check out this recipe from Rachel Cooks. spice blends is best stored in a sealable jar or container. You want to make sure you store your spice seaoning in a sealed container so that it will not absorb flavors from other spices in your spice cabinet. Homemade spice blends will last up to 6 months, and while safe to consume after 6 months, it has the best flavor in that time frame. After 6 months, dried spices begin to lose their potency. Great way to save money and control the ingredients! You bet! It is crazy what some of those packets have in them! I popped over to check these out — awesome! Great resource that I’ll keep on hand! Thanks for this useful info, need to save this post definitely! Oh this is kinda cool. Would check it out! Thanks for linking up to the Bloggers Brags Pinterest Party. I have pinned your post to the Bloggers Brags Pinterest Board. I’m so excited about this!!!! Thanks for sharing at the Let’s Get Real Blog hop!! Pinning for sure! Aw! Awesome. I am so glad this will be helpful to you! I saw the spice mix recipes on don’t waste the crumbs site. Is there a recipe for the salt free seasoning salt ? There is a picture showing it above the regular seasoning salt. Thanks. You can omit the salt and then you are left with the equivalent of a salt free seasoning salt 🙂 Thanks for checking with me, I will go back and note that on the Don’t Waste the Crumbs site.